We were scratching our heads for a while, wondering what has changed since the Wildfire S, and it turns out there’s quite a bit that’s different. The HTC Explorer features an HTC-style unibody like the Sensation had (not technically a unibody, but that’s what they call the design). It’s mostly made of a patterned, rubbery plastic, but also features a plate of brushed metal on the back. The youngster looks pretty good. Some things haven’t changed – like the 3.2″ HVGA LCD screen – but the chipset inside is entirely new. The CPU is clocked at 600MHz again, but it’s an ARMv7 processor, not ARMv6. We dug a little deeper and here’s what we found – the Explorer uses a Snapdragon S1 chipset (MSM7225A) with a Cortex A5 processor and Adreno 200 graphics. The software has been updated as well – Android 2.3.5 Gingerbread and Sense 3.5 sound really good. Plus, since this is an ARMv7 processor, we managed to install the Adobe Flash player from the Android Market. The camera in the HTC Explorer has been demoted to a 3MP fixed-focus unit, but it doesn’t matter much for an entry level device. Storage-wise, it has a 90MB internal storage and supports expandable microSD card up to 32GB. 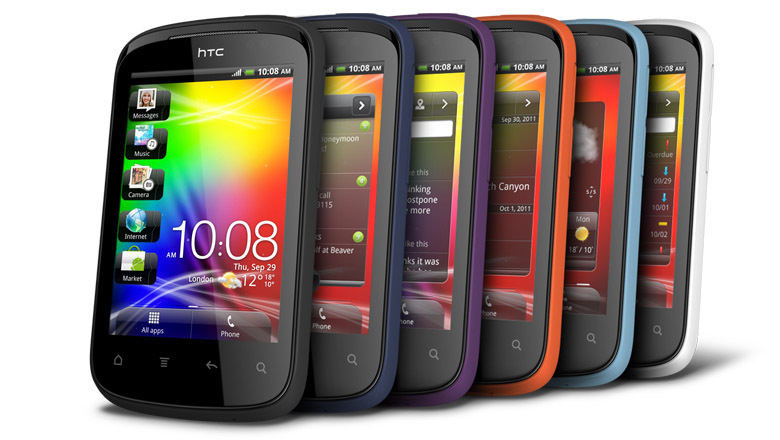 The device also comes with a range of customizable back covers including Metallic Blue, Orange, White and Purple.